Ordered food at 3:48, get there at 4:25, order says complete on my phone and they somehow never got the order at the store. I was looking forward to my 12 dollar burger and then had bad customer service from the workers getting the money back on my card. Shame. 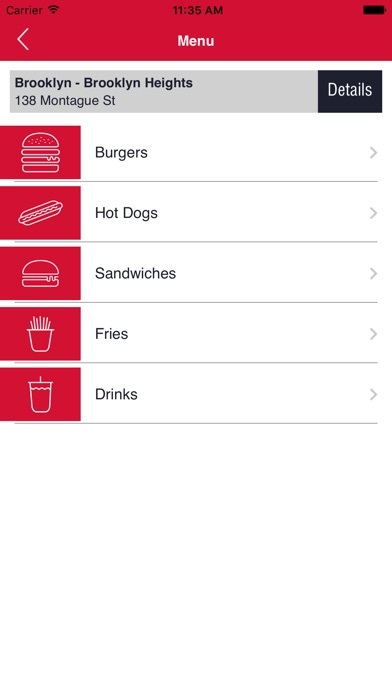 I enjoy Five Guys food greatly but I feel as if the app doesn’t have as many options as it should. Face to face I often ask for extra bacon on my bacon cheeseburger and this app doesn’t allow me to do so in the condiments section. I also wish that it had an option to save your card information as it never save mine and it’s just a mild inconvenience to me to have to retype it all each time. App works great, up until you hit the “Place Order” button, you then are greeted with the message “Credit Card not supported by this location” I have tried several Credit Cards and three different locations around me with the same results. Not sure what good this app is if you can’t actually order the food. Lots of options but would be better if it allowed access to pay options already in the phone. App is convenient but useless if the staff at the store don’t pay attention...I showed up and they hadn’t even started cooking my order, so I wasted time on the app! This review is for Version 3.3 running on an iPhone X iOS 11.4. Why the hell is the text so small now? I'm talking disproportionately and unbelievably small. I can barely read the text. The patch notes only said and I quote "enhancements to the user experience." Ha! Good one. You might've fixed some bugs but you have caused the app to become severely difficult to read not to mention this app doesn't even have iPhone X compatibility yet. I mean come on guys, the X has been out since last November and still no support. The only reason I'm not giving this app one star is that the ordering process is very fast and works without a hitch. Just fix the dang UI please. The app was down and I happened to go to my bank app and it was charged two time for my order!!! I had to pay a toal of three times to get me food! The store is saying have the call. Customer service the CS saying go to the store!!! I’m getting passed! Love this app and the burgers! I tried to place an order 5 times both on the app and on the website and I got a message saying too many login attempts when I didn’t log in to an account in the first place. It’s frustrating adding everything to your cart, putting in your payment only to get the same message over and over again. Place order en route and still waited 20 min for food. Staff served other customers as we waited. I love this location! The staff is friendly, the restaurant is clean and everyone always greets me with a smile. I’m quickly becoming a regular. Great idea but totally poor execution...burger was cooked within 7mins of placing my order online. Arrived at the location and proceed to wait in a line for ~15min to get to the counter and then wait for fries to cook. By the time I got my order, my burger was sitting for 25+ mins. This app works amazingly and never had a problem with it. Very simple to the point. The app hasn’t been updated in a year. For some reason, I can no longer add things to the cart without error messages now. Won’t be standing in line either. They got our order wrong and didn’t give us an item that we ordered, I was told they couldn’t refund because we ordered through app. This is one of the best food apps out there. You can order and EASILY customize your food. Then pay and pick up when you want (as fast as 7 minutes for us!). No fuss, just great function. Ordered online in about 3 minutes got to the store in 5 during dinner hour and waited about 4 minutes and was on my way. Everything was done perfectly and they gave me a ton of fries as well. Best burger joint out there. 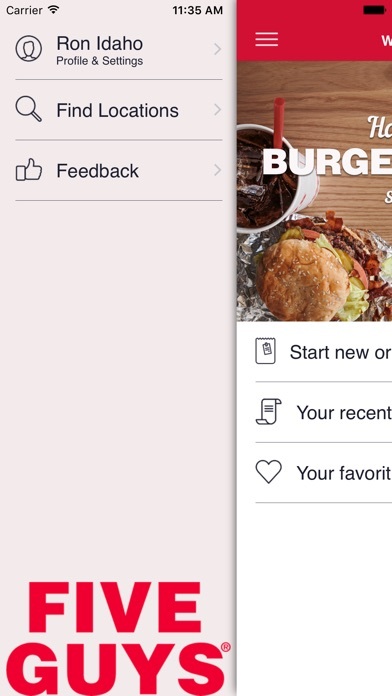 The app needs Apple Pay, as a payment method for ordering. This app is super easy to use and it’s so nice to be able to order and have it ready! Unfortunately, you still need to wait in the regular line while the food is in the bag getting cold. Doesn’t make sense. This app was SERIOUSLY the easiest order experience I have ever had, AND they accept gift cards over the app. Other restaurants should really copy this streamlined layout, and they’d probably make a few more sales. The only thing I had to wait for when I arrived at the store was my fries, which are always made to order. A+++++++++++++++++++ App. 5 guys should only ever get 5 stars. Food is top notch and the they always have a quality staff. Thanks for existing! App is good - service is S. L. O. W.
App works perfect but you still have to wait 10-15 minutes for your order. So basically the app is pointless. Good food. Fry guy needs to step it up. Slow motion and day dreaming. Mobile orders getting cold oblivious. Had to go to counter twice and still not catching on. Hire better! This app does exactly what it is supposed to do, and it does it perfectly. I made an order online. Super easy. No problem. Got my burger not the 7 min after the order but 17 minutes later I made the order in my car to save time figuring it was dinner time. Not many people in here, three people ahead of me who got their orders before I did. I had four people standing around until I said I was looking for my order. The cashier said it was ready and it was not at all. IT WAS NOT even prepared! No condiments as requested either. I got a plain burger without what I ordered. The receipt clearly said what I asked for on it. The people doesn't even look at you except for the cashier who was nice. Not my favorite location after this experience. I decided to treat myself and I paid for an un-enjoyable meal. I was in my car on the way before I opened it to eat. It was not one mistake, it was many. How all apps should be!! Clear, easy, fast, and reliable! What else could you want? I can’t get enough of this place!!! The burgers, the dogs, the incredible overload of fries!!! The super easy app is user friendly, and the food is ready when I get there!!! You can’t place your order on the app due to a glitch.. I love the staff here. They always get my order perfect and their management team has the best attitude I have ever seen in my life. They always make me feel important and have a special happy energetic mood that brightens up my day. I am a regular customer and extremely loyal to the barnet way location located off of emory road near the emory interstate exit. And to make it even more special to me, I suffer from celiac disease, and I am deathly allergic to even cross contamination. I can not dine out at any sit down restaurants and probably 99% of fast food. Even when I order off their “gluten friendly” menus I still get sick. And I have never had any issues with cross contamination at this location. This means more to me than you can ever know. Dealing with my autoimmune disease is an everyday battle, so its nice to know that the management and team here can be trusted! Million stars from me! Couldn’t cancel on the app an accidental duplicate order. Went to use the app and couldn’t cancel the app for an accidental duplicate order. Luckily they handled it at the store. Nice try but they don’t tell you how/where to pick up your order. Also it was 14 minutes AFTER they said it would be ready that I received my order. They don’t know how to do this yet. Quality of food, and consistency every time makes for success. It would be nice if you could name burgers to store combo recipes. It seems like the store waits a little too long to make the food, I usually get there before it’s ready, versus Panera where it’s ready and on the shelf. Excellent service!! Extremely welcoming and friendly! Great food! App is wonderful when the food is ready when it says it will be - today I had to wait ten minutes past the time the app said my order would be ready - when I arrived my I filled to go bag was just sitting there waiting to have to order made - that’s not the point of the app - it’s supposed to be ready for pick up at the time stated. Also - the stores need designated spots for 5 minutes parking for app pick up to go orders - when I arrived the only spots open were handicapped - I had to circle and wait before a spot opened up. Why no extra bacon option? What is the fracking point? 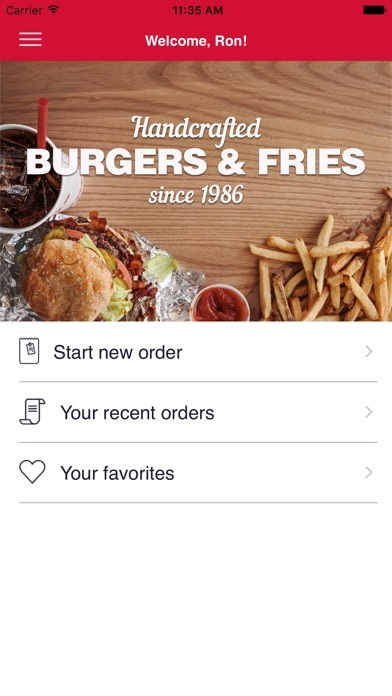 Why make an app where you have to go pick up the burger anyway after you make an order? It's easier to just go to the store and make your order, they make it in the line and you get your burger instantly anyway. Otherwise you get a cold burger! Stupid app. The app needs a spot to add notes to an order. 5 guys more like this guy! Freakin love this joint!12/10 keep it up broham! The font on the app is so darn tiny I can’t see any of the prompts or directions to even place an order. Please make a change to wording size so I don’t need a magnifying glass. No good until then. I don’t understand how, after so many months, you still haven’t fixed your app. The font size is absolutely too small on the iPhone X to be useable. How can you accept this? This app does not support ApplePay so I have to re enter all my credit card credential. Fine. The scan card function never worked and I just hold my card in front of the camera. Fine. Even when I enter my card credential by hand, it still tells me that that’s not a valid card number! Dear developers, if you don’t know how to code, use ApplePay PLEASE so you don’t upset your users! There is no way to add comments to the order or to tell the store there is a food allergy (gluten) with your order. You can do this in person, but not the app. Love the FG app, but they eliminated the option to order a fountain drink, can only order bottles. I guess that’s a good thing as it pushes me to drink water instead, but wish they allowed ordering fountain drinks like they used to. Every time I place an order, it never goes through. I thought it was just the restaurant I usually go to, but it doesn’t work, regardless of where I go and order. I always make I’m connected and have plenty of bars, but my order will never go through. Apparently, unlike the Android version, you can’t just add cards to a wallet without ordering first. Why? Are the devs that stupid? I’m trying enter a gift card number someone got me, but I don’t want to order food now...just save it for later. Many other apps give you that option. In today’s day and age...it’s stupid not to. So, two stars it is. 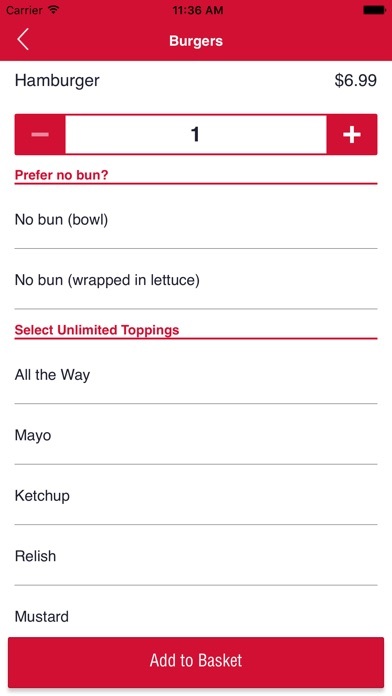 Beautiful app, love the fine details like “regular” “light” or “extra” for toppings. Unfortunately there is no cash option or Apple Pay option. Spent a lot of time happily creating my order only to be disappointed at the end. Will have to place my order in person and wait like they did in the Stone Age. Cannot use Apple Pay in the app. Only option as a guest is a gift card or pay I. Store. Very convenient haha. Not optimized for iPhone X. Hire a new developer guys. This needs an overhaul. Great app that works but.... Can’t see the font on the iPhone X/XS/XS Max phones. Way too small, please fix this! The app is OK but can use some tweaks. They need to add the option to have burger cut in half or a section to add additional instructions. The online ordering experience makes no sense. The entire order should be ready for pickup. I appreciate fresh fries, but the point of ordering in advance is to pick up the food quickly and get out. The burgers are made by the time I get there, but when I arrive, there’s the added french fry wait. By waiting to make the fries, it results in soggy burgers. By trying to avoid soggy fries, it gives us soggy burgers. Update this app for the new iPhones please. The text is so small I can't read it well. If I make the iPhone text a lot bigger, the app text is barely readable. You need to change the text settings. Otherwise, it's everything is want in an online ordering system. new update to “Ordering enhancement” became worse because of the change from cc payment to Pay in Store/gift card. Apple Pay should have been an option. I have to be honest when I first started using food apps I was skeptical and ran into some bumps but Five Guys app worked so smoothly. I ordered, drove there and it was ready when I got there. Five minutes from order time to eating. It was great! The app seems to be getting more streamlined. Interface is cleaner. It would be nice if the app showed more info on reorders, like toppings and specific shake ingredients. And, lastly, it would be so much faster and safer if Apple Pay was implemented. Gets the job done, love being able to order on my way when I’m in a hurry. I get that this might be a web app with a native app wrapper, but yikes on the font size guys! It’s maybe 2pt in size and completely illegible and renders the app useless. I’ll download it again if you fix the font size. Apple pay would make this app so much faster!